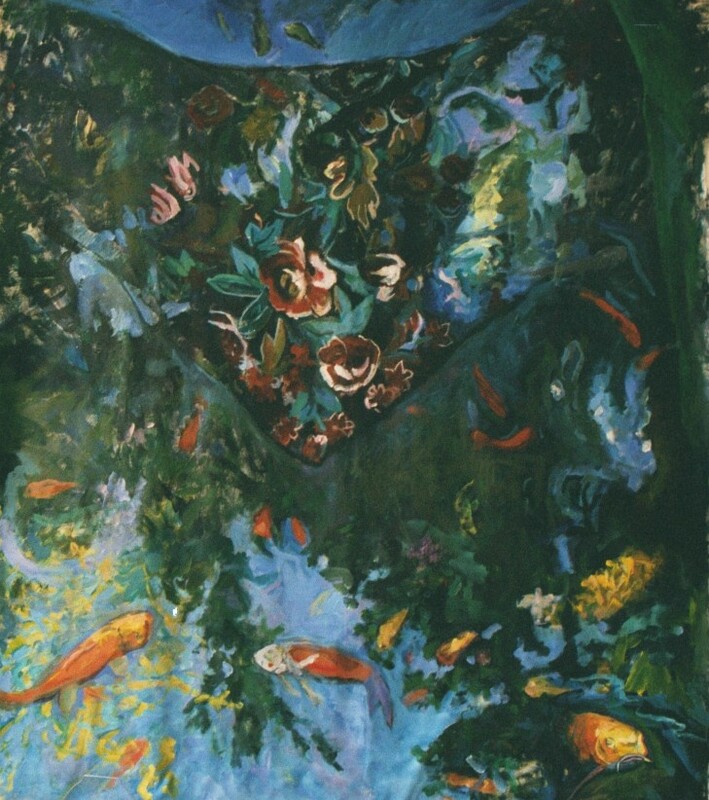 I painted this large painting because I wanted to portray the beauty of sitting beside a pool of water — of watching koi move through the depths and rise to the surface, and to have the confused image of depths and surfaces and reflections. “Agenor” is the name of the central fish. He is taken from a painting by the French 20th century painter Pierre Bonnard. Agenor was Bonnard’s fish; these fish are his American “friends.” It’s my way of paying tribute to this artist from the past that I love. It is beautiful this painting, where do the fishyfish end and the flowers begin? Somewhere beyond imagining. I had written just the other day about there being a relationship between the fish and the flowers, and I never realized I had put both motifs into one subject until I read your comment! This is why one blogs, I think! One would have thought I might be referring to this painting when I wrote about the comparison, but fact is I had completely forgotten it. Artists really need to have an audience for their images to find out what the full meaning of the images even is. I really believe that — because much of what an artist notices and expresses arises from one’s involvement in the world around us — and who is really completely aware? Lots of things are going on that we notice, but perhaps we don’t notice that we notice … until others point things out. Meaning gets ferreted out over time. Do you find this true as a poet? Yes I do absolutely. In fact there is a discussion on a page I don’t show on my blogthingy anymore in which Narnie and I come to the same conclusion almost. That an artist without any audience can’t really go anywhere. It raises lots of questions though which I struggle with. At some point I feel like the relationship between the artist and the audience is manipulative and then questions of consent arise and practical questions of how to go about getting an informed audience. Oh, by the way I really just came by to say I have put fishyfish in my piece “Stop” under this link because I remembered your Koi and how each one was different and unique. You are a remarkable artist. Thank you, Paul. I want to see where my fish swam to — if they swam to your poems — how wonderful. Thank you for your very kind comment, L Terzia. I am glad that you enjoy the blog. It means a lot to hear that the Big Painting adventure is finding friends!